Dinner tonight: Barbecued Pork Chops. Classic summer cooking: Barbecued Pork Chops, Grilled Potato Salad and Coleslaw. Both the chops and the potatoes can be down in the kitchen as well. The coleslaw will be good for several days. 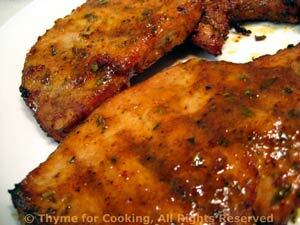 Perfectly simple: a quick marinade to add flavor and moisture followed by a quick cooking on the grill. I used rather thin, boneless chops. Cook on barbecue for 5 - 8 minutes per side or until done. Should be slightly pink in the middle, or near the bone if bone-in, when done - take a peak (techniques). Note: If you cook it too long pork tends to be dry - unless you cook it really, really long - but that's winter cooking ... this is summer. A reduction of white Balsamic vinegar, sweetened with a bit of sugar, give these the hint of potato salad, but keeps the crispness from roasting. Put oil and paprika in a large bowl, add potatoes and toss, coating thoroughly. Cook on barbecue (grill) for 20 - 30 minutes or until done... and you will need to stir them with a long-handled wooden spoon occasionally as they tend to develop 'hot spots' and can get a little crispy. While the potatoes cook, heat vinegar and sugar in a small saucepan. Boil until reduced by half. Keep warm. 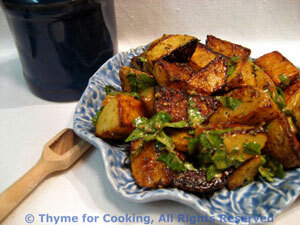 When potatoes are done put them into a serving dish, pour vinegar over, sprinkle with basil and serve. Another salad from my mother's collection.... But I'm pretty sure she got it from a local restaurant as the original recipe made 8 quarts! I cut it down a bit, and made a change or two to make it easier for the home chef. This coleslaw was almost as famous as the Fish Fry! To shred cabbage: cut a slice off of the head, lay the slice cut side down, cut into 4ths, then, cutting across, slice very finely: 1/16" - 1/8" (.3cm). Do not use the core of the cabbage - you'll recognize it when you see it. Slice the pepper thinly, then cut the slices into 1/2" (1cm) pieces. Put all of the ingredients in a medium bowl. Using as large a whisk as you have (and is reasonable), vigorously whisk ingredients together. The sugar will dissolve and the dressing get very thick and clear. Note: Use food processor for slicing if you have one. 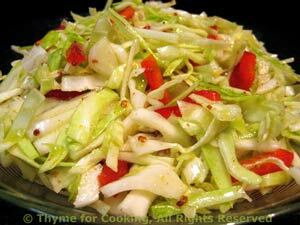 Slice thinly or shred coarsely.